Wykeham Gallery Artist Nicola Godden was born in 1959 in Germany. Her father was in the Army and she lived in many countries, including Kenya, Cyprus and Singapore where she says she had lots of wonderful light, colour and freedom – all later to be influences on her work. She studied art at the West Surrey College of Art and Design in Farnham. Nicola’s work falls into two distinct categories, namely portrait and abstract sculpture. She loves the differences of the two – the precision and accuracy required in portraiture and the freedom of expression she can bring to her abstract pieces. She strives to express the human without its shallow, shell like persona and show the essence of what is really underneath it all. Each piece might start with a new loose idea, suggested by a piece of bone or flint she has found which reminds her of some part of a human form. Nicola never works from drawings because she feels it would kill the spontaneity. By using wire to get the movement and flow, she quickly moves on to clay or plaster and the piece is then cast in bronze. The process of casting is complex and time consuming and she tries to be involved in each stage of the process where she can. 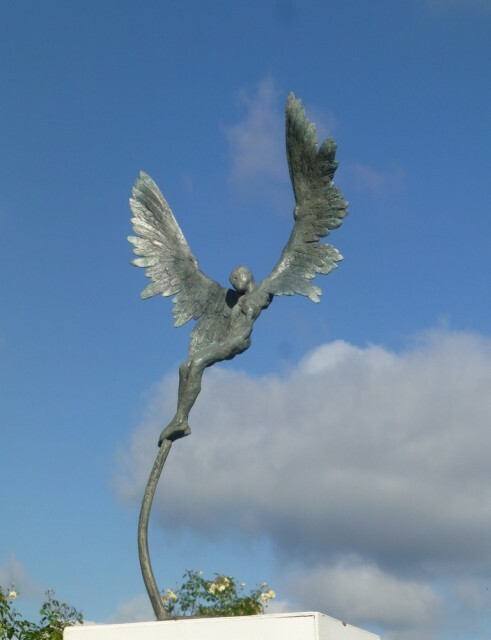 In 2012, Icarus I* was on display in the Olympic Village during the London Olympics. 3.5 metres high, this commissioned piece represents Nicola's latest passion - flight. Icarus is, of course, the mythical boy who flew with wings made by his father Daedalus to escape from King Minos. Nicola got her Private Pilot's Licence in 2011 and flies an Ikarus aeroplane. This change in her life helped with the inspiration for the latest work.